Being in the confusion of Bangkok for a while and starting to feel the need to explore something different? How about taking a bus directly from Bangkok to Phnom Penh and, in less than one day, mingle yourself in the Kingdom of Cambodia? Keep reading for a quick guide on how to do this trip hassle-free! Don’t miss the opportunity, if you are in Bangkok you are just 13 hours of journey away (and for as little as 25 dollars) of exploring charming Cambodian capital. Its vibrant street life, growing night scene, and its cultural interest make it a major attraction for tourists in South East Asia. A young but growing artistic community, plenty of availability of chilled cafés and trendy bars, Phnom Penh is definitely a must in your travel route! The easy route from Bangkok to Phnom Penh will make it even more attractive. This border crossing between Thailand and Cambodia got famous for scams and uncomfortable experiences but is actually simple to cross the border in a smooth manner. Read on to get to know how! 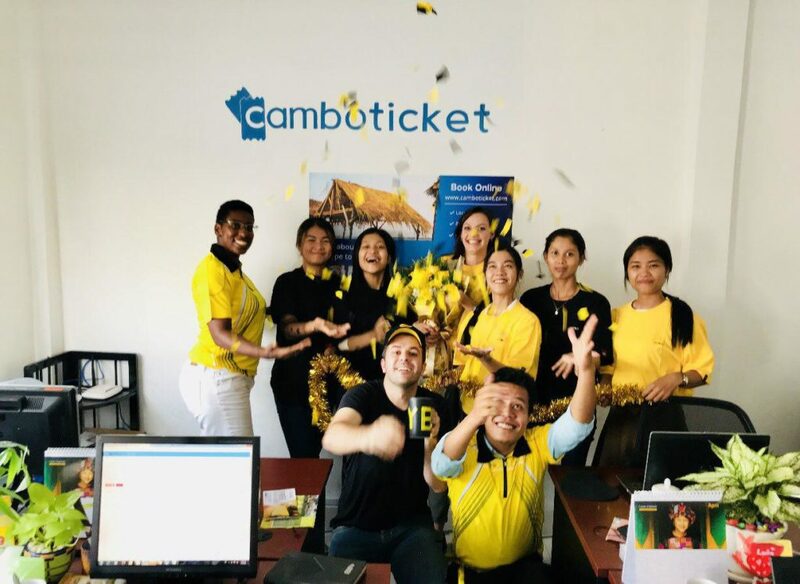 So if you are already thinking to head from Bangkok to Phnom Penh by bus or minivan to explore the magic of the Kingdom of Cambodia, check out CamboTicket website for options: comfortably booking your trip online in Camboticket means you can pay by credit or debit card (Visa, Mastercard or JCB), as well as cash on delivery in case you are in Phnom Penh booking your ticket to Bangkok (in this article we are covering the bus from Bangkok to Phnom Penh but the majority of its info is valid for the other way around). Price: 25 USD, with Wi-Fi onboard and water bottle and a towel included. Boarding station: Soi 17 Phetchaburi Road, in front of Prince House, Thanon Phaya Thai, Bangkok. Price: 38 USD, with Wifi onboard and a water bottle and a towel included. Boarding station: Mekong Express, Soi 17 Phetchaburi Road, in front of Prince House, Thanon Phaya Thai, Bangkok. Boarding station: VET, #51, Chao Fa Road and Soi Ram Buttri, Travel Mart, Khwaeng Chana Songkhram, Khet Phra Nakhon. On the journey date, head to the boarding station of the company you have chosen (both of the addresses easily explained to any tuk-tuk driver) and there, our bus or mini-van will bring you to the border town of Aranyaprathet (on thai side) and Poipet (on cambodian side). Along the way there will be plenty of stops for toilet, refreshment, snacks or just to walk around a little bit. About the border crossing, some advice can turn your experience as smoothly as possible, for instance it helps if you already have dollars with you to pay for the visa (american dollars are one of the currencies used in Cambodia) otherwise you’ll be charged more if you pay it in bahts (the exchange rates near the border will be highly inflated). This border town is famous for its scams but is easy to have a hassle-free experience, just don’t pay attention to people on the street trying to sell you visas or asking for your passport, even if they say they work for the government or any other excuse they can come up with (they are usually creative!). Just decline politely and keep going until you reach the official visa office. Bare in mind that tourist visa can only be extended once, so in case you are thinking to stay longer in Cambodia (believe us, there is no lack of reasons, we know for personal experience!) another option is the business visa for 35 dollars (E class, valid also for 30 days but multiple entries and with no need of any addition documents to get it). This visa can be extended indefinitely for 1, 2, 3, 6 or 12 months so feel free to enjoy Phnom Penh or any other place in Cambodia for as long as you want. Other option is to apply to your tourist visa online, where you can get a single entry for 30 days which costs 37 dollars. Apply at www.evisa.gov.kh and expect around 3 days to get your visa, worthwhile option in case you want to have a quick bureaucracy-free experience while passing the border (although you would still have to wait for the other people in the same bus to take care of their own visas, but worry not, for that you have places around the border for a coffee, snacks or using the toilet). After that… welcome to Cambodia! When you leave Poi Pet border, it’s another 7 or 8 hours to reach Phnom Penh, perfect timing for a nap before getting yourself immersed in the lively Cambodian life. Besides the capital, you can also take direct bus from Bangkok to Siem Reap (around 9 or 10 hours for about 25 dollars) to get to know the mysterious and beautiful Angkor Wat, the biggest temple complex in the world; as well as Battambang (6 to 8 hours, for as less as 16 dollars), the second largest city in the country but yet with a calm atmosphere and genuine Cambodian lifestyle by the river, lush green sceneries around (including a cave where you can watch millions of bats flying out during sunset) or the infamous bamboo train for you to experience a different ride! Check out timings and prices below. Price: 28 USD, with Wifi onboard and a water bottle and towel included. Departure and arrival time: 6 AM – 12 PM, 8 AM – 4 PM or 9 AM – 3 PM. Price: 16 USD, with Wifi onboard and a water bottle and towel included. Book your bus from Bangkok to Phnom Penh online now!